Patrick Mahomes finished 5 of 7 for 33 yards on his two drives. KANSAS CITY, Mo. — Patrick Mahomes had a quiet first start for the Kansas City Chiefs. 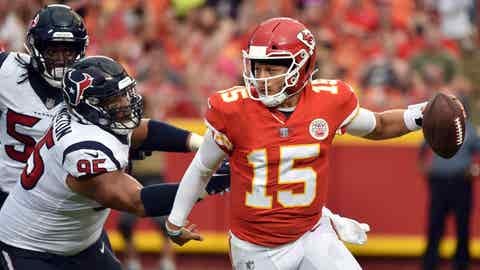 Eventually, Chiefs fans will get to see Mahomes’ full ability on display. He didn’t complete a pass longer than 14 yards and never targeted Sammy Watkins, who signed a three-year, $48 million deal in the offseason. Watson won the Texans’ starting job last season but missed the second half of the season with a torn ACL. He played only one series and threw only one pass — a 4-yard completion to wide receiver Bruce Ellington — while handing off four times to running back Lamar Miller. Brandon Weeden took over for Houston after the game’s opening drive and led back-to-back touchdown drives, including a 12-play, 68-yard drive during his first series that was capped by a 6-yard touchdown pass to rookie tight end Jordan Akins. Chiefs safety Eric Berry (Achilles’ heel) didn’t dress for the game. Backup Eric Murray got the start instead alongside rookie safety Armani Watts, who replaced injured starter Daniel Sorensen (knee). Houston had its share of absences as well, including linebacker Whitney Mercilus (soft tissue injury), who didn’t make the trip. There were no protests from players on either team during the national anthem, although a few Chiefs, in particular, stood well off the sideline near the benches. It didn’t appear that any players went to the locker room for the anthem. Coach Andy Reid said the Chiefs had three injuries — C Jimmy Murray (left knee), RB Kerwynn Williams (head) and G Ethan Cooper (left shoulder).